One of the worst nights you can have at a campsite is when your body cannot keep you warm at night and you wake up. If you know how to stay warm in a sleeping bag this will prevent you from waking up and you will have a great night. Being warm in bed when it is cold outside is one of camping’s greatest pleasures! One of the worst nights you can have at a campsite is when your body cannot keep you warm at night and you wake up. If you know how to stay warm in a sleeping bag this will prevent you from waking up and you will have a great night. Being warm in bed when it is cold outside is one of camping’s greatest pleasures! Weather can change suddenly. Even if the weather report states warm nights, you still want to prepare for sudden changes. It is best to be prepared for anything, including a cold night. At the end of a hiking day, wash the dried sweat from your body. Dried sweat can act like a heat conductor chilling you. If there is no shower try to find a lake or creek where you can wash yourself (depending on the weather of course, if it is too cold then you might want to avoid getting wet). You can use a quick drying towel to wipe yourself off. If you forgot to take a towel you can also use a shirt. After washing yourself change into dry clothes to sleep. The best clothes you can wear are a hat, socks and one thermal base layer on your body. Make sure none of these layers are made of cotton. Cotton holds moisture and that is not what you want. Your clothing should be able to breathe and wicker the moisture away from your body. Consider that your extremities get cold more easily, these need extra protection. To keep your feet warm you can pile extra clothes under the foot end of your sleeping bag to give your feet more insulation against the cold ground. Or you can stick a water bottle filled with hot water in the foot of your sleeping bag. If that is not enough, you can put a second bottle filled with hot water in de middle of your bag. If you use this tip make sure they are sealed tightly. Use an insulated pad or air mattress rated with an insulation value for the lowest temperatures you expect to encounter. If needed you can use a second foam pad when you are sleeping on frozen ground or snow. If you are using a short pad to save weight, lay your empty backpack under your feet to insulate them from the ground, so the cold ground cannot drain heat from your body. For your sleeping bag the same goes as with the sleeping pads. Take care to choose a sleeping bag that is rated to keep you warm at the lowest temperatures you expect during your trip. Also see if you can get your hands on a down insulated sleeping bag. Down insulation has a much better warmth to weight ratio than as synthetic sleeping bag and in general they last longer. Take a look at our down sleeping bags here. 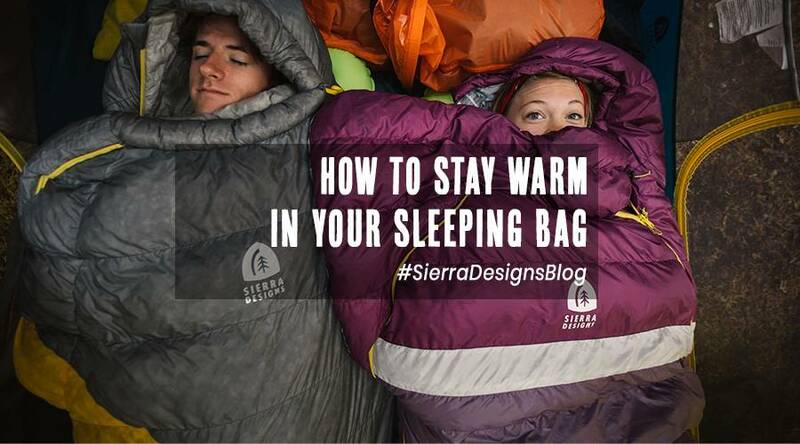 For more warmth in you sleeping bag you can use a sleeping bag liner, which can add the equivalent of several degrees of rating to a sleeping bag. There are even sleeping bag liners available which are specifically for increasing the insulation of your sleeping bag. If you get into your sleeping bag cold, even with additional clothing and lining, you are likely to stay cold. Before you get into your bed, have a warm drink, have a brisk walk or do some star jumps to bring your core temperature up a bit before snuggling down for the night. You can even eat a delicious snack high in fat right before going to bed to fuel your body through the night. If you are hiking with a partner who does not get cold easily and you share a tent, ask that person to sleep on the tent’s windward side. If you are with more than one partner, sleep between them or at least position your bags and pads close together to benefit from one another’s body heat. If you are alone or with a partner make sure your tent is not overly big. A big tent has a lot of empty space. In this empty space air can circulate freely and will not be able to hold any warmth. Sleeping compartments in a big tent are usually easier to warm up than bigger living spaces. So if your trip is just a short camping trip for a couple, consider downsizing your tent, or switching to a canvas or polycotton tent.